At Computex Taipei 2007, SanDisk showed off its two new additions to its line of solid state drives (SSD): SanDisk 1.8-inch 64GB UATA 5000 and 2.5-inch 64GB SATA 5000 SSD products. This was trumped by PNY’s announcement of a 2.5-inch 128GB SSD. SanDisk and PNY are stating read speeds of 67MBps and 66MBps, respectively. How’s that for fast boot times and file access, eh? Neither company lists prices for the drives since they seem to be only going to OEMs right now. PNY sells its 32GB drive at around $350 for large volume orders, so you do the math. Also, don’t expect the PNY drives till third quarter 2007 (its 128GB drives I mean, the 32GB models are currently shipping). 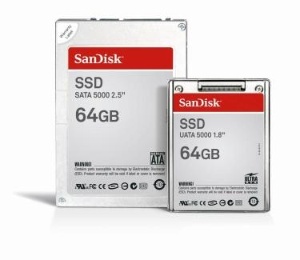 SanDisk’s new 64GB models, however, are available now.